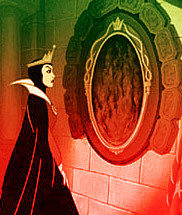 The story of a magic mirror and a jealous queen. One day in the middle of winter, when the snowflakes fell from the sky like feathers, a queen sat at a window netting. Her netting-needle was of black ebony, and as she worked, and the snow glittered, she pricked her finger, and three drops of blood fell into the snow. The red spots looked so beautiful in the white snow that the queen thought to herself: "Oh, if I only had a little child, I should like it to be as fair as snow, as rosy as the red blood, and with hair and eyes as black as ebony." At last she sent for a hunter, who lived near a forest, and said to him, "Hunter, I want to get rid of that child. Take her out into the wood, and if you bring me some proofs that she is dead, I will reward you handsomely. Never let her appear before my eyes again." So the hunter enticed the child into the wood; but when he took out his hunting-knife to thrust into Snow-white's innocent heart, she fell on her knees and wept, and said, "Ah, dear hunter, leave me my life; I will run away into the wild wood, and never, never come home any more." She looked so innocent and beautiful as she knelt, that the hunter's heart was moved with compassion: "Run away, then, thou poor child," he cried; "I cannot harm thee." "She will be devoured by wild beasts," he said to himself. But the thought that he had not killed her was as if a stone-weight had been lifted from his heart. When it was quite dark the masters of the house came home. They were seven little dwarfs, who dug and searched in the mountains for minerals. First they lighted seven little lamps, and as soon as the room was full of light they saw that some one had been there, for everything did not stand in the order in which they had left it. Then said the first, "Who has been sitting in my little chair?" The second exclaimed, "Who has been eating from my little plate?" The third cried, "Some one has taken part of my bread." "Who has been eating my vegetables?" said the fourth. Then said the fifth, "Some one has used my fork." The sixth cried, "And who has been cutting with my knife?" "And some one has been drinking out of my cup," said the seventh. Then the eldest looked at his bed, and, seeing that it looked tumbled, cried out that some one had been upon it. The others came running forward, and found all their beds in the same condition. But when the seventh approached his bed, and saw Snow-white lying there fast asleep, he called the others, who came quickly, and holding their lights over their heads, cried out in wonder as they beheld the sleeping child. "Oh, what a beautiful little child!" they said to each other, and were so delighted that they would not awaken her, but left her to sleep as long as she liked in the little bed, while its owner slept with one of his companions, and so the night passed away. "I am called Snow-white," she replied. "But how came you to our house?" asked one. The dwarfs talked a little while together, and then one said, "Do you think you could be our little housekeeper, to make the beds, cook the dinner, and wash and sew and knit for us, and keep everything neat and clean and orderly? If you can, then you shall stay here with us, and nobody shall hurt you." "Oh yes, I will try," said Snow-white. So they let her stay, and she was a clever little thing. She managed very well, and kept the house quite clean and in order. And while they were gone to the mountains to find gold, she got their supper ready, and they were very happy together. But every morning when they left her, the kind little dwarfs warned Snow-white to be careful. While the maiden was alone they knew she was in danger, and told her not to show herself, for her stepmother would soon find out where she was, and said, "Whatever you do, let nobody into the house while we are gone." The queen was furious when she heard this, for she knew the mirror was truthful, and that the hunter must have deceived her, and that Snow-white still lived. So she sat and pondered over these facts, thinking what would be best to do, for as long as she was not the most beautiful woman in the land, her jealousy gave her no peace. After a time, she decided what to do. First, she painted her face, and whitened her hair; then she dressed herself in old woman's clothes, and was so disguised that no one could have recognised her. Watching an opportunity, she left the castle, and took her way to the wood near the mountains, where the seven little dwarfs lived. When she reached the door, she knocked, and cried, "Beautiful goods to sell; beautiful goods to sell." Snow-white, when she heard it, peeped through the window, and said, "Good-day, old lady. What have you in your basket for me to buy?" "Everything that is pretty," she replied; "laces, and pearls, and earrings, and bracelets of every colour;" and she held up her basket, which was lined with glittering silk. "I can let in this respectable old woman," thought Snow-white; "she will not harm me." So she unbolted the door, and told her to come in. Oh, how delighted Snow-white was with the pretty things; she bought several trinkets, and a beautiful silk lace for her stays, but she did not see the evil eye of the old woman who was watching her. Presently she said, "Child, come here; I will show you how to lace your stays properly." Snow-white had no suspicion, so she placed herself before the old woman that she might lace her stays. But no sooner was the lace in the holes than she began to lace so fast and pull so tight that Snow-white could not breathe, and presently fell down at her feet as if dead. "Now you are beautiful indeed," said the woman, and, fancying she heard footsteps, she rushed away as quickly as she could. Not long after, the seven dwarfs came home, and they were terribly frightened to see dear little Snow-white lying on the ground without motion, as if she were dead. They lifted her up, and saw in a moment that her stays had been laced too tight Quickly they cut the stay-lace in two, till Snow-white began to breathe a little, and after a time was restored to life. But when the dwarfs heard what had happened, they said: "That old market-woman was no other than your wicked stepmother. Snow-white, you must never again let anyone in while we are not with you." When she heard this she was so terrified that the blood rushed to her heart, for she knew that after all she had done Snow-white was still alive. "I must think of something else," she said to herself, "to get rid of that odious child." Now this wicked queen had some knowledge of witchcraft, and she knew how to poison a comb, so that whoever used it would fall dead. This the wicked stepmother soon got ready, and dressing herself again like an old woman, but quite different from the last, she started off to travel over the mountains to the dwarfs' cottage. "Go away, go away; I must not let you in." "Look at this, then," said the woman; "you shall have it for your own if you like," and she held up before the child's eyes the bright tortoise-shell comb which she had poisoned. Poor Snow-white could not refuse such a present, so she opened the door and let the woman in, quite forgetting the advice of the dwarfs. After she had bought a few things, the old woman said, "Let me try this comb in your hair; it is so fine it will make it beautifully smooth and glossy." "You paragon of beauty," said the wicked woman, "all has just happened as I expected," and then she went away quickly. Fairer a thousand times than thee." As the looking-glass thus replied, the queen trembled and quaked with rage. "Snow-white shall die," cried she, "if it costs me my own life!" Then she went into a lonely forbidden chamber where no one was allowed to come, and poisoned a beautiful apple. Outwardly it looked ripe and tempting, of a pale green with rosy cheeks, so that it made everyone's mouth water to look at it, but whoever ate even a small piece must die. As soon as this apple was ready, the wicked queen painted her face, disguised her hair, dressed herself as a farmer's wife, and went again over the mountains to the dwarfs' cottage. When she knocked at the door, Snow-white stretched her head out of the window, and said, "I dare not let you in; the seven dwarfs have forbidden me." "But I am all right," said the farmer's wife. "Stay, I will show you my apples. Are they not beautiful? let me make you a present of one." "No, thank you," cried Snow-white; "I dare not take it." "What!" cried the woman, "are you afraid it is poisoned? Look here now, I will cut the apple in halves; you shall have the rosy-cheek side, and I will eat the other." The apple was so cleverly made that the red side alone was poisonous. Snow-white longed so much for the beautiful fruit as she saw the farmer's wife eat one half that she could not any longer resist, but stretched out her hand from the window and took the poisoned half. But no sooner had she taken one mouthful than she fell on the ground dead. "White as snow, red as blood, and black as ebony; this time the dwarfs will not be able to awake thee." Then had her envious heart rest, at least such rest as a heart full of envy and malice ever can have. The little dwarfs, when they came home in the evening, found poor Snow-white on the ground; but though they lifted her up, there were no signs of breath from her mouth, and they found she was really dead. Yet they tried in every way to restore her; they tried to extract the poison from her lips, they combed her hair, and washed it with wine and water, but all to no purpose: the dear child gave no signs of life, and at last they knew she was dead. Then they laid her on a bier, and the seven dwarfs seated themselves round her, and wept and mourned for three days. They would have buried her then, but there was no change in her appearance; her face was as fresh, and her cheeks and lips had their usual colour. Then said one, "We cannot lay this beautiful child in the dark, cold earth." So they agreed to have a coffin made entirely of glass, transparent all over, that they might watch for any signs of decay, and they wrote in letters of gold her name on the lid, and that she was the daughter of a king. The coffin was placed on the side of the mountain, and each of them watched it by turns, so that it was never left alone. And the birds of the air came near and mourned for Snow-white; first the owl, then the raven, and at last the dove. Snow-white lay for a long, long time in the glass coffin, but showed not the least signs of decay. It seemed as if she slept; for her skin was snow white, her cheeks rosy red, and her hair black as ebony. It happened one day that the son of a king, while riding in the forest, came by chance upon the dwarfs' house and asked for a night's lodging. As he left the next morning he saw the coffin on the mountain-side, with beautiful Snow-white lying in it, and read what was written upon the lid in letters of gold. Then he said to the dwarfs, "Let me have this coffin, and I will give you for it whatever you ask." But the elder dwarf answered, "We would not give it thee for all the gold in the world." But the prince answered, "Let me have it as a gift, then. I know not why, but my heart is drawn towards this beautiful child, and I feel I cannot live without her. If you will let me have her, she shall be treated with the greatest honour and respect as one dearly beloved." As he thus spoke the good little dwarfs were full of sympathy for him, and gave him the coffin. Then the prince called his servants, and the coffin was placed on their shoulders, and they carried it away, followed by the king's son, who watched it carefully. Now it happened that one of them made a false step and stumbled. This shook the coffin, and caused the poisoned piece of apple which Snow-white had bitten to roll out of her mouth. A little while after she suddenly opened her eyes, lifted up the coffin-lid, raised herself and was again alive. "Oh! where am I?" she cried. Full of joy, the king's son approached her, and said, "Dear Snow-white, you are safe; you are with me." Then he related to her all that had happened, and what the little dwarfs had told him about her, and said at last, "I love you better than all in the world besides, dear little Snow-white, and you must come with me to my father's castle and be my wife." Then was Snow-white taken out of the coffin and placed in a carriage to travel with the prince, and the king was so pleased with his son's choice that the marriage was soon after celebrated with great pomp and magnificence. Then the wicked woman uttered a curse, and was so dreadfully alarmed that she knew not what to do. At first she declared she would not go to this wedding at all, but she felt it impossible to rest until she had seen the bride, so she determined to go. But what was her astonishment and vexation when she recognised in the young bride Snow-white herself, now grown a charming young woman, and richly dressed in royal robes! Her rage and terror were so great that she stood still and could not move for some minutes. At last she went into the ballroom, but the slippers she wore were to her as iron bands full of coals of fire, in which she was obliged to dance. And so in the red, glowing shoes she continued to dance till she fell dead on the floor, a sad example of envy and jealousy.